Au croissant de lune - Le vieux Québec et le centre des Congrès à votre porte ! (Français) Pour votre confort ! To maximize your comfort and well-being, we offer you a range of services within our house. We hope that you will enjoy it ! We had such a wonderful time in Quebec staying at Gite Au Croissant de Lune. Patricia was so warm and welcoming and we felt completely at home. We had to change our itinerary and Patricia was very accommodating and helpful. 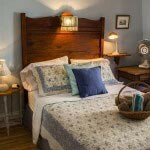 The Gite is very nicely decorated and clean, breakfast was delicious, and the location was absolutely perfect – walkable to anywhere in Quebec! We would definitely stay there again next time in Quebec! This is a real wonderful B and B – excellent breakfast – nicely furnished room – clean – great location – casual and at same time very much attention paid to guests and their needs – Patricia is a wonderful welcoming host .. I’d stay here anytime .. felt right at home! We stayed at the Gite Au Croissant de Lune in November 2013 for two nights and had a truly wonderful trip. 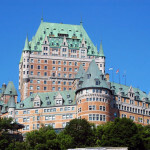 It is located close to Old Quebec and Many other attractions are a short drive away. There is parking close by at the Delta for $18 a day and when its cold there is underground heated parking for the same price. Patricia was very welcoming and the rooms are clean and warm. Breakfasts are delicious and just enough to get your day started without being over stuffed and ready for a morning Siesta. If you are extra hungry she always has a selection of Bagels and toppings at the table to add to your breakfast. Thanks for making our stay so great! Patricia and her family were lovely and welcoming hosts, our room (the yellow room) was clean and pretty. The breakfasts we had were both delicious and were served in a beautiful, sunny dining room. We slept very well and the neighbourhood truly is a gem. We will visit Au Croissant de Lune again when we are next in Québec. We had a great time at this B&B. We stayed here with our 3 month old daughter and had everything that we needed. It is wonderfully clean and quiet. The location is ten minutes from the ice rink in Old Quebec (Place D’Youville). In the morning, we enjoyed delicious breakfasts, that were also light on our stomachs ! We can’t wait to return !! A friend and I just had a wonderful time at the Gite Au Croissant de Lune. It was clean and quiet and so close to everything including the old town and the Congress (where my conference was being held). The host was super nice and helpful and served many a delicious breakfast. I cannot wait to go back. Thank you. Terrific location, fantastic breakfast, very clean, comfortable beds…..but the best feature by far is this delightful family. Patricia is the primary and very gracious host, but Oliver and their two charming children were very much a part of making this stop a real highlight of our trip. We were two couples celebrating our anniversaries and they helped make it very special. We highly recommend Gite Au Croissant de Lune. We stayed in the lovely romantic yellow room. The room is clean, with enough space for luggage. On the same floor there is a large beautiful bathroom, and a washroom to share with the other guests. 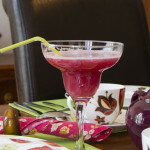 Breakfast is delicious with lots of home made jams and you can’t miss Patricia lovely cooking. Patricia is also a wonderful owner, always smiling, and helping us for everything we needed. The B&B is not far from the centre, just 15 minutes by walk. The main road is also full of shops, bars, and restaurant. Patricia and Olivier are wonderful hosts. They made us feel like part of the family, and were exceptionally helpful for all aspects of our stay. The area in which the B&B is located is charming in its own right, walking distance from the Old City.